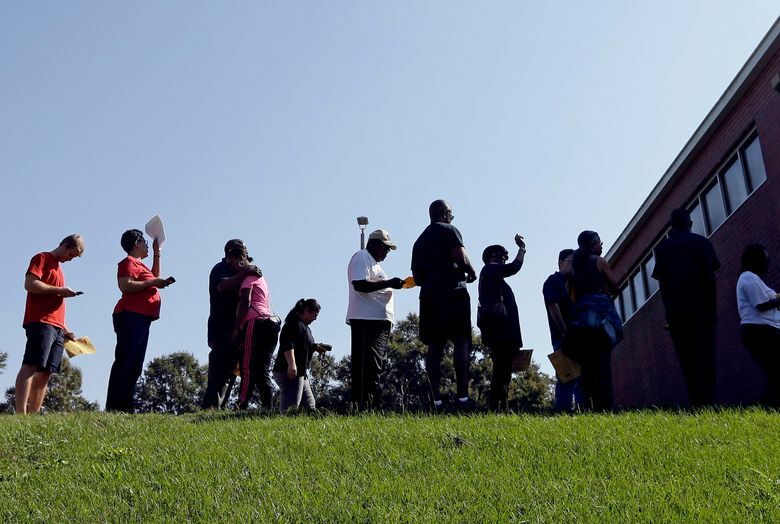 RALEIGH, N.C. (AP) — Federal investigators in North Carolina are seeking an enormous number of voting records from dozens of election offices weeks before the midterm elections, demands that may signal their expanded efforts to prosecute illegal voting by people who are not U.S. citizens. The U.S. attorney’s office in Raleigh issued subpoenas in recent days on behalf of Immigration and Customs Enforcement to the North Carolina elections board and more than 40 county boards in the eastern third of the state, according to the subpoenas and the state board. The same federal prosecutor announced two weeks ago that 19 foreign nationals were charged with registering to vote or casting ballots illegally because they weren’t U.S. citizens. More than half were indicted by a grand jury in Wilmington, according to an Aug. 24 news release from U.S. Attorney Bobby Higdon’s office. The subpoenas direct the information — which the state elections board estimates would cover well over 20 million documents — be provided to a Wilmington grand jury Sept. 25, or before that to a Raleigh-area immigration agent. Higdon’s office had no comment Wednesday, a spokeswoman said. Last month’s news release said the investigation into voting fraud was ongoing. Still, voting rights activists described the massive document request as a fishing expedition that could discourage lawful voting. Separately, election officials are worried about trying to meet the deadline while gearing up to administer elections for Congress, legislature and constitutional amendments. Counties could seek deadline delays and the state board plans to discuss its subpoena at a Friday meeting. Samples of county board subpoenas seek all ballots, poll books and voter authorization forms over the past five years. The subpoena to the State Board of Elections and Ethics Enforcement wants records going back to 2010, including voter registration applications, absentee ballot request forms and provisional balloting forms from all 100 of the state’s counties. Sebastian Kielmanovich, an assistant U.S. attorney who also signed many of the charges announced in August, told Lawson that counties could request deadline extensions, according to email correspondence provided by the state board. Production and printing of ballots already have been delayed this fall in North Carolina by unrelated litigation. Now state officials are working to meet a Sept. 22 deadline in federal law to make absentee ballots available to military and overseas voters. “With so many well-established threats to our election process from abroad, it is odd to see federal resources directed to this particular concern,” Crayton said in a release. Greg Flynn, vice chairman of the Wake County elections board, which received a subpoena, said he’s concerned the solemnity of the secret ballot will be threatened should investigators scrutinize absentee ballots. Unlike ballots cast on Election Day, absentee ballots can be linked back to the individual voter. The state elections board counts nearly 2.3 million such traceable ballots cast during the five-year period in the 44 counties. “The broad scope of this subpoena suggests that they don’t understand how elections work and how elections are managed,” Flynn said in an interview. The document chase Wednesday in eastern North Carolina didn’t seem to reflect a new uptick in federal scrutiny nationally of voting records and identifying illegal voters. Last month’s cases were brought through a newly created Document and Benefit Fraud Task Force led by Immigrations and Customs Enforcement. Those charged came from Mexico, Nigeria, Japan, Germany, Poland and other countries. A state board postelection audit for the November 2016 election — in which 4.8 million ballots were cast — counted 41 people who were not U.S. citizens who acknowledged voting. All of them were lawfully in the country, the review said. President Donald Trump has claimed, without evidence, that he lost the national popular vote that year due to voter fraud.